I bought an antique leather embossed screen in London not sure exactly where I would deploy it, but I bought it because I always wanted one. It has always easily found a place in my decor. In my current house it fills what would have been an empty space in my bedroom. A beautiful screen can fill a wall, divide a room, or just be a beautiful object! 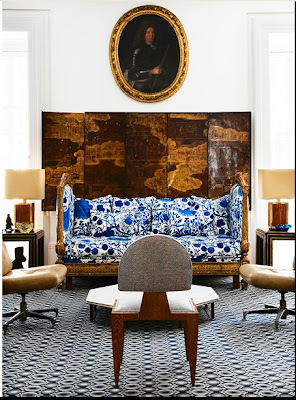 The Spanish decorator, Lorenzo Castillo, uses screens quite often. Here are two examples. 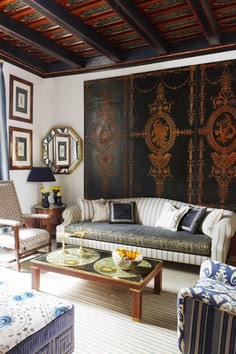 One is an embossed leather screen mounted on the wall behind a sofa creating a huge decorative focal point in the room. 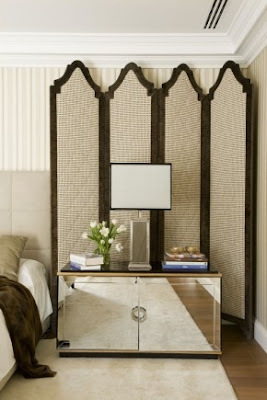 The second is a simple upholstered screen where the frame does the speaking with it's carved curves. It adds a layer to the room, and softens the look of the mirrored dresser. 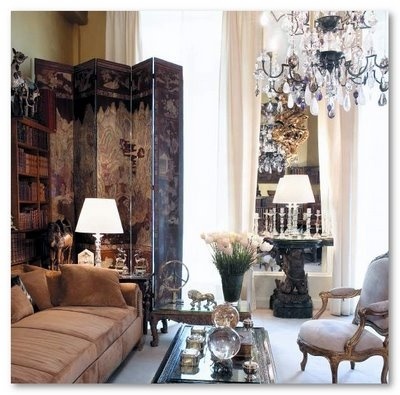 In Coco Chanel's Paris apartment a massive Chinese screen fills a corner and provides chic decoration. 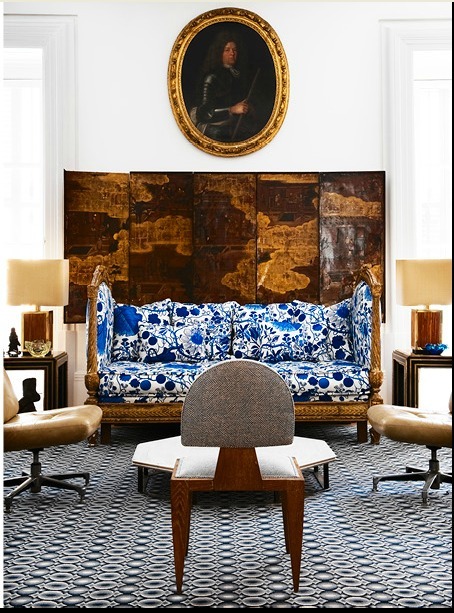 Here is another Lorenzo Castillo room with a fabulous screen behind an antique sofa creating quite a statement in this living room. The upholstery is a bold choice given the rest of the decor. 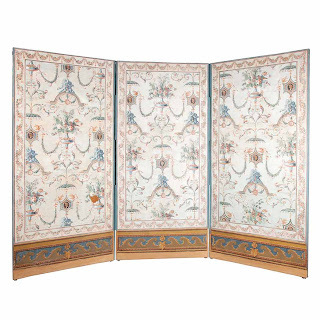 Auctions provide ample variety and price range when shopping for a screen for your decor. I've selected a range of styles as examples. 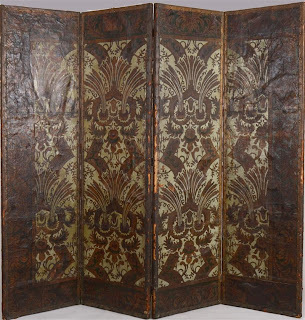 I love my embossed and painted leather screen, and here is one that was sold at a Sair Galleries auction in Hudson, NY. I think this one is quite smart looking. It sold for $1,900 off an auction estimate of $800 - $1,200. It measures 76 inches tall and a total width of 85 inches. 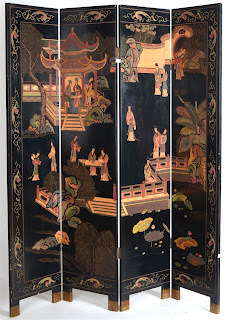 This Chinese four panel lacquer screen also sold at a Stair Galleries auction, but this one went for $100, off an auction estimate of $300 - $400. This measures 72 inches tall and 64 inches wide. This would be great on a wall, in a corner, or as a very chic room divider. 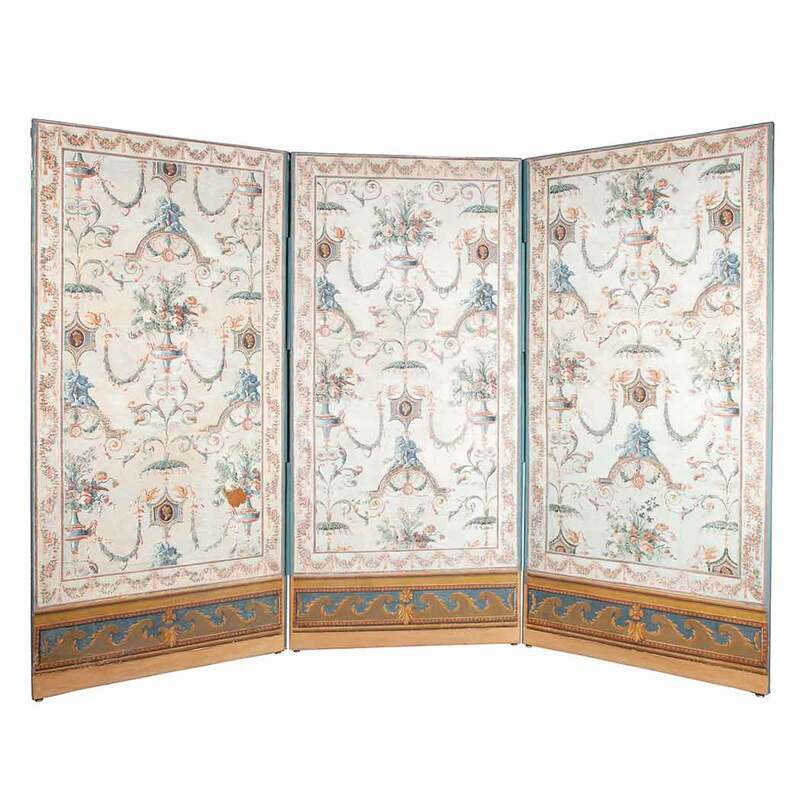 For a very different style, you might consider this French 19th century neoclassical painted screen. The design is quite delicate and lovely. This measures 67 inches tall and each panel is 31 inches. This sold at a Doyle New York auction for $1,000 off an auction estimate of $1,000 - $1,500. 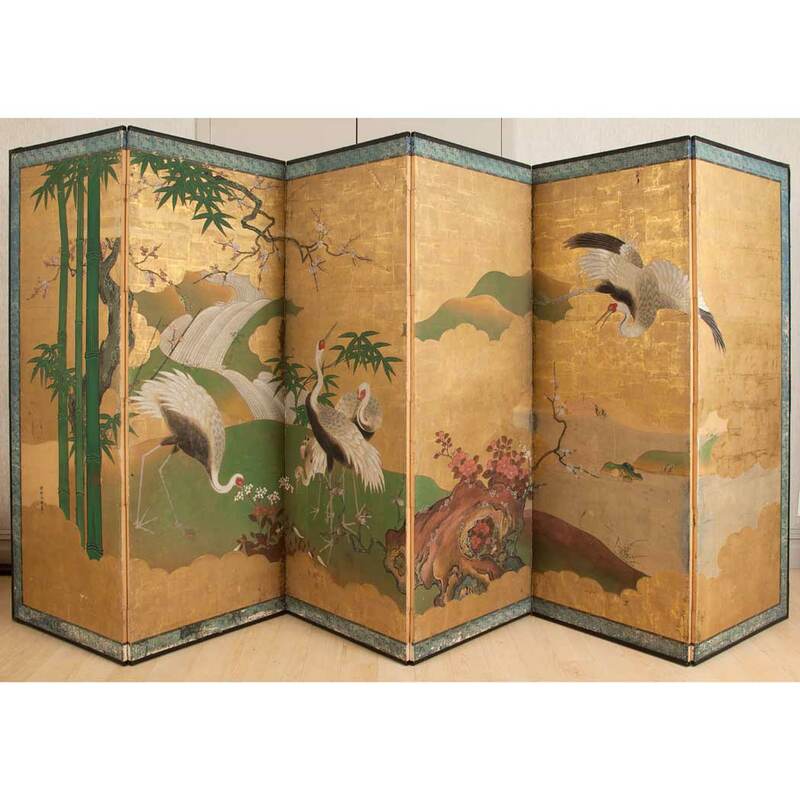 A Chinese screen with a gold ground is a wonderful way to brighten up a room. 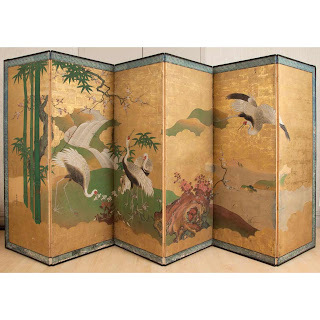 This is a very large six panel screen measuring 67 inches tall, and each panel is 25 inches wide. The design is crane and bamboo. This sold at Doyle for $2,125 off an auction estimate of $800 - $1,200. 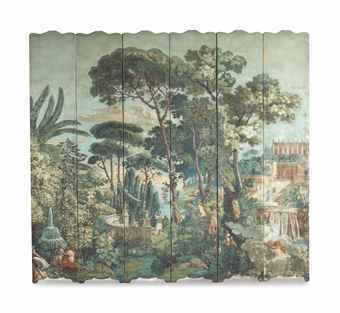 If you can't afford the real thing, this 'Zuber type' wallpaper 6 panel screen is just the thing. I could easily see this mounted on a wall in a dining room, or any other room for that matter. 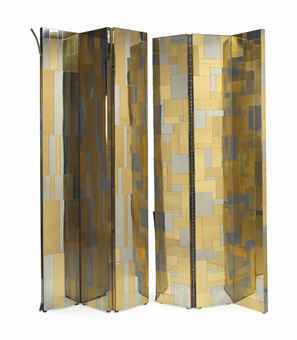 This is being offered at a Christies Interiors auction in New York June 18th and 19th (Lot 376). 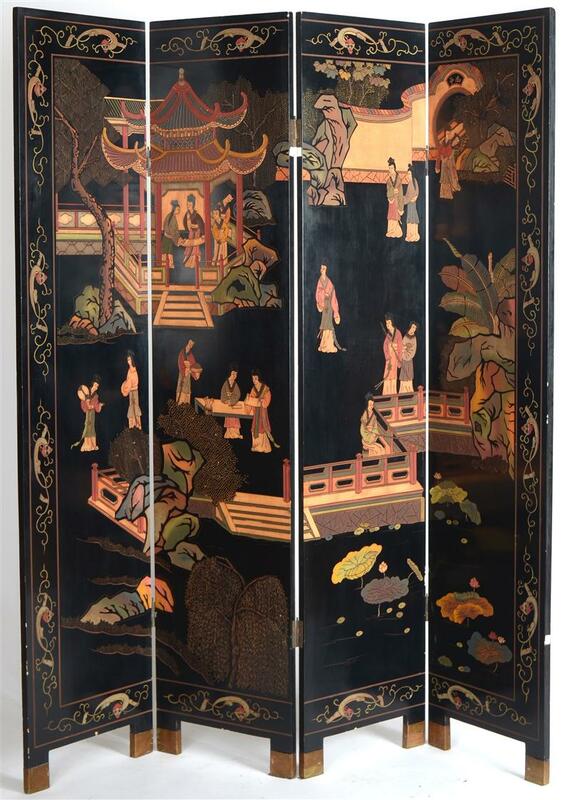 The auction estimate of $1,500 - $2,000, and it measures 95 inches tall and each panel is 17.5 inches wide. For a modern vibe, this Paul Evans (1931 - 1987) circa 1970 brass and chromed metal screen is very cool. This is being offered in the same Christies sale (Lot 719) with an auction estimate of $1,000 - $1,500. It measures 80 inches tall and each panel is 12 inches wide. 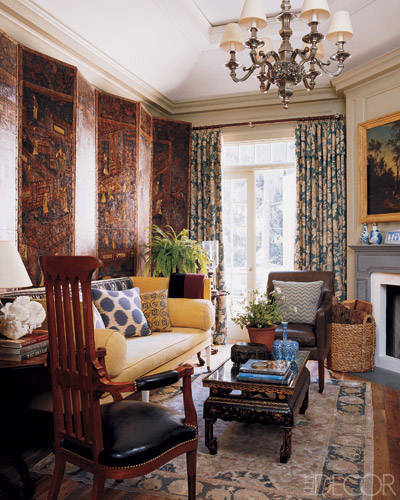 In Michael Smith's home the entire wall in this room is taken up by a wonderful screen. Think of all the ways you can use on, and find one that will move with you no matter where you live at auction!